The 46th meeting of the season, held yesterday at the Marsa Racetrack, was made up of ten races, all for trotters. Four of the races in programme were heats and heralded the start of the Prix D’Enghien Championship for French trotters registered in Gold Class. These races were held over a long distance of 2,640 metres. The card also included a Premier Class race which was won by Ranch Get On (Charles Magro). Sixteen horses took part with pre-race favourite Ranch Get On increasing its pace with a lap to go. 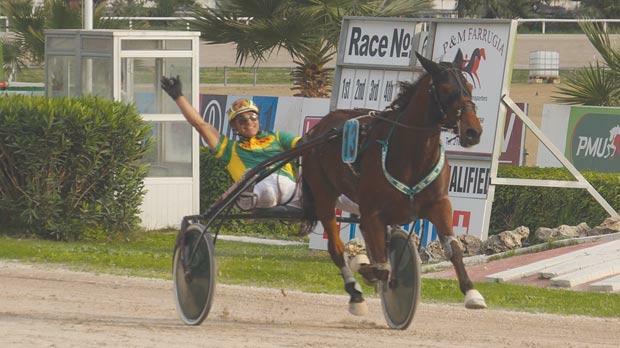 This Finnish 11-year-old trotter nosed ahead around 600m from the post and went on to chalk up its second consecutive win ahead of Quartz De Gautiers (Clint Vassallo) and Vanmaker Limburgia (Charles Camilleri). Pacific Joy (Anthony Bartolo) completed the top-four order. Ranch Get On clocked an average time of 1.17” per kilometre. In the first Gold heat, Qurieux Du Ponchet was unchallenged for almost the entire distance. Under the guidance of Clint Vassallo, this 11-year-old trotter went on to gain its second win of the year, a length-and-a-half in front of Rex Du Braud (Charles Farrugia). Solide Du Jayle (Tony Cauchi) was third ahead of Quel Homme (Noel Baldacchino). Early leader Nitesco d’Antony (David Ellul) ran out of steam with less than 500m to the finishing line in the second championship heat yesterday. Ellul’s horse was outsmarted by Quintet Du Vivier (Charles Camilleri) which notched its fourth win of the season. Quermes Rush (Frenċu Cassar) was second ahead of Phenix De La Roque (Noel Baldacchino) as Nitesco d’Antony had to settle for fourth place. In the third heat, Quiz Du Lys (Rodney Gatt) ran untroubled in the final lap before sealing its first win of the year from Rubis Du Chanoy (Noel Baldacchino). Newcomer Time Square (Michael Ellul) and Tresor De Quesny (Andrew Farrugia) also had a fine race, finishing third and fourth respectively. A keen tussle between two strong contenders developed in the final metres of the remaining Gold Class heat. In the end, it was Ourasi Diams (Emmanuel Fenech) which registered its first win at Marsa after beating the challenge of Quefi Des Caillons (Michael Ellul). Quintet (Brian Zammit) and Turbulent (Frank Portelli) also made it to the next stage of the championship. Meanwhile, the opening Silver Class heat at Marsa yesterday had a thrilling finale as a dead heat was called between Quozak Prior (Redent Magro) and Quartz De L’Isac (Charles Farrugia). Not even the photo-finish, consulted by the racing stewards, could separate the two trotters which were eventually declared joint winners of the race. The next meeting at Marsa is scheduled for next Sunday. This programme will include the President’s Cup.